Members of Nihonmachi Outreach Committee and Silicon Valley JACL carried banners during a candlelight procession from on the SJSU campus. 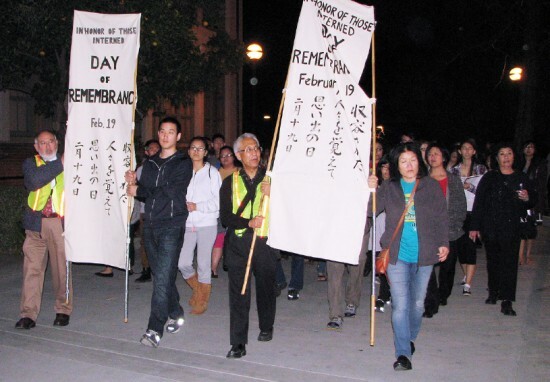 SAN JOSE — “Wartime Hysteria” was the theme of the 36th annual Day of Remembrance program presented by Nihonmachi Outreach Committee (NOC) on the San Jose State University campus on Feb. 14. 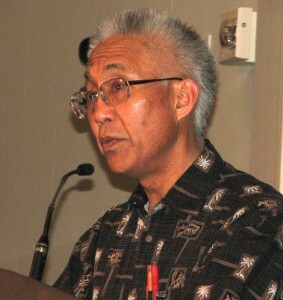 Masao Suzuki of Nihonmachi Outreach Committee. Speakers drew parallels between the Japanese American experience and the current anti-Muslim bias being encouraged by public figures following terrorist attacks in Paris, San Bernardino and elsewhere. Aggie Idemoto of the Japanese American Museum of San Jose (JAMsj) noted that the event is traditionally held at San Jose Buddhist Church Betsuin, which is currently undergoing renovation. This year’s site was selected because local Japanese Americans had to register for internment at the San Jose State College men’s gymnasium in 1942. The building has since been renamed Yoshihiro Uchida Hall in honor of a pioneer judo coach and community leader. Uchida attended the event. Rev. Hajime Yamamoto of Wesley United Methodist Church, who gave the aspiration, recalled hearing about his grandmother, who was forced by the Japanese military to serve as a battlefield nurse in Burma and returned home only to find that two of her three children had died. While he was aware that many innocent people, especially children, suffered because of Japan’s actions, Yamamoto said he only became aware of the Japanese American internment after coming to the U.S. two years ago. He is now educating people in Japan about this “shameful” history. 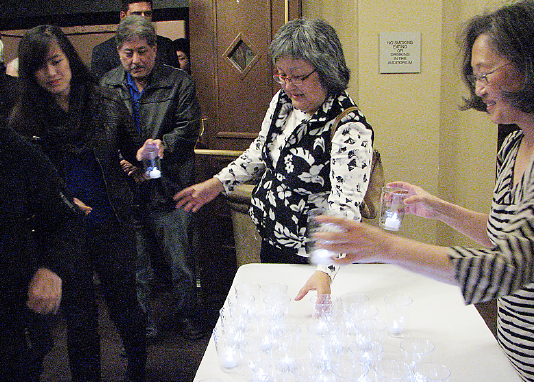 Attendees were given candles as they walked from Morris Dailey Auditorium to Yoshihiro Uchida Hall. Judo legend Yosh Uchida (left), for whom Uchida Hall is named, participated in the march. Ann Muto, a published poet who was born in the Poston camp in Arizona, discussed the emotional toll that the experience had on her family and read a poem about the registration at what is now Uchida Hall. Zahra Billoo, executive director of the Bay Area Chapter of CAIR (Council on American-Islamic Relations), recalled that after 9/11, the Muslim American community hoped that the backlash would end in a few weeks, but weeks became months and months became years. 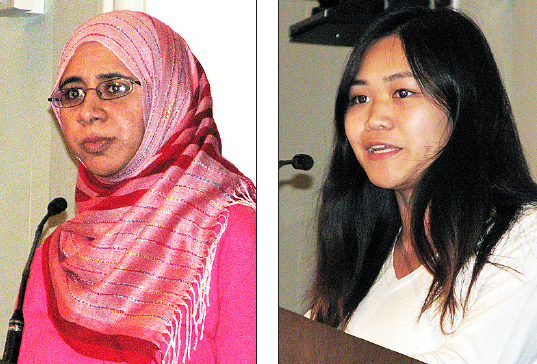 Left: Zahra Billoo spoke for the Council on American-Islamic Relations. Mei Suzuki, a student at UCSD, was the youth speaker. Mei Suzuki, Masao Suzuki’s daughter, a volunteer at JAMsj and NOC, and a student at UC San Diego, has attended Day of Remembrance her entire life. 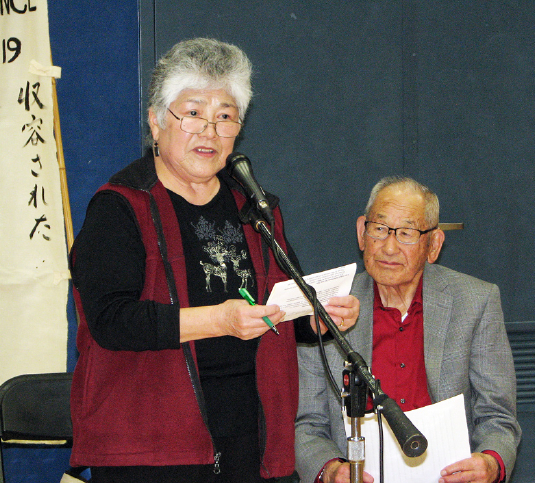 She said that as a child she looked forward to the taiko drumming and the candlelight vigil, but as she grew older she listened to the speeches and learned about her grandmother’s incarceration in the Heart Mountain, Wyo. camp. Rep. Mike Honda (D-San Jose) was scheduled to speak but had to cancel due to urgent business in Congress. His statement was read by his district director, Lenine Umali. 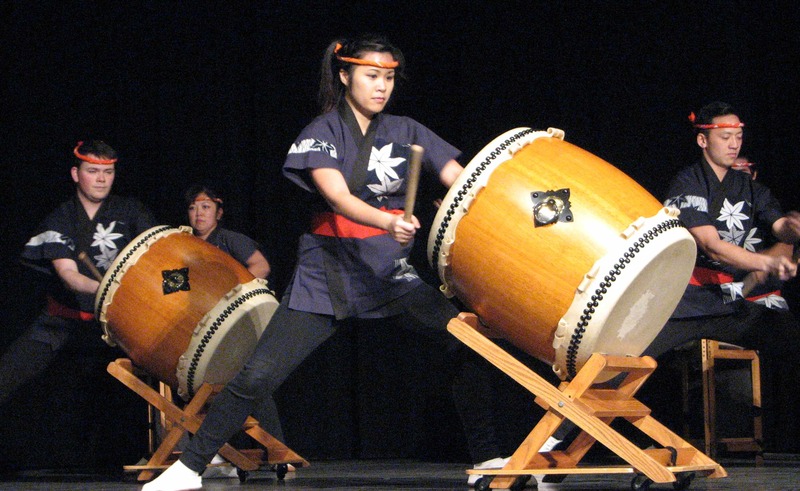 San Jose Taiko performed a piece composed for Day of Remembrance. San Jose Taiko, a fixture at Day of Remembrance events, performed three pieces, including one titled “DOR.” Performing members Alix Koyama and Matt Ogawa said that they are proud members of the San Jose Japantown community who are carrying on the legacy of their family members who were interned. During the candle-lighting ceremony, Sharon Uyeda of San Jose JACL and Reiko Nakayama of NOC called out the names of the camps as individuals with ties to SJSU, including Uchida and Muto, lit candles on a stand with miniature barracks representing the camps. Attendees marched from the main venue, Morris Dailey Auditorium, to nearby Uchida Hall, with members of Silicon Valley JACL and NOC carrying banners. The main speaker at the gym was Jimi Yamaichi, 94, a founder of JAMsj who was interned at Pomona, Heart Mountain in Wyoming and Tule Lake in Northern California. He resisted the draft while interned, but unlike resisters in other camps, Yamaichi and others at Tule Lake were exonerated. “Approximately 72½ years ago, my brother and I walked into this very building as instructed on a poster we saw tacked on a telephone pole in our neighborhood,” he said. “The poster said to report to the San Jose State College, Men’s Gymnasium, on Saturday, May 23, 1942 — and that by 12 o’clock noon, the following Saturday, both ‘aliens’ and ‘non-aliens’ were to be evacuated to an assembly center. “It also stated that the size and number of package we could bring were limited to that which could only be carried by the individual or family group. In other words, one could take only what one was able to carry. “The interior of this building has not changed since 1942. The plank bleachers are still intact, with the pull-down benches for the players. My brother and I sat to the far right corner in this gym waiting to be called to be registered. The four registration tables were located in the center of this gym. “When I finally registered, our family was assigned the number 32420 … During our stay in camp for the next four years, we were no longer recognized as ‘Yamaichi.’ We lost our identity to a number. To this day I have not forgotten my number. 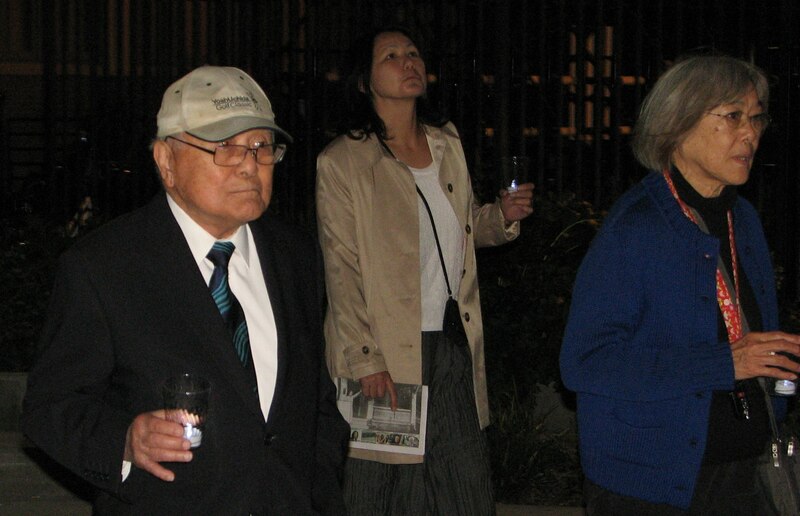 Jimi Yamaichi, who reported for internment at San Jose State College in 1942, was introduced by Aggie Idemoto of the Japanese American Museum of San Jose. “When war was declared, my family had just finished harvesting cabbage and our winter crops when our friend and buyer for Consolidated Produce Company, Mr. Myers, came by to tell my father that he had received a phone call from his boss to return to the main office in Los Angeles as soon as possible. In those days there were no freeways, so it took him 12 hours to go from San Jose to L.A.
“When I entered the Pomona Assembly Center prior to being transferred to Heart Mountain, Wyo., I carried a 1-A draft card. Then, in the fall of 1942, my draft status was changed to 4-C, or ‘enemy alien.’ My second brother had been drafted right before war was declared and was later transferred to Fort Riley, Kan. Once there he was stripped of his weapons and was given a wooden rifle and wooden side arms, whereas his buddies could keep their regular rifle and side arms. Imagine his humiliation marching alongside his buddies using wooden weapons. “Despite this treatment, however, my brother still volunteered to join the 422nd all-Japanese American combat unit during World War II, which would become one of the most decorated units in the military history of this country. “Meanwhile, having been moved from Heart Mountain, Wyo. to Tule Lake Segregation Center on May 2, 1944, I received a notice for pre-induction. I felt torn about this. Having heard from my brother about his experiences in the service, I decided not to report. After all, I was not a free man, confined behind barbed-wire fencing with guard towers surrounding us. “During the first week of July 1944, 27 draft evaders were picked up by the U.S. marshal at the Tule Lake visitor’s gate. The two U.S. marshals, one in each car, took four persons each to Eureka, Calif. until all 27 of the evaders were in custody at the Eureka County Jail. We then all marched down to the Federal Courthouse. This was the first time that we saw each other. As we walked down the street, a crowd began to gather around us. “Inside the courtroom, the judge asked us several questions, but the one which I recall most vividly was ‘Under what conditions do you live?’ I spoke up, telling him that there were 27 guard towers, man-proof fences, and parallel warning fences surrounding the camp site. The judge responded, ‘In other words, you are confined and not free.’ I said yes. The event was sponsored by Asian Law Alliance, Japanese Chamber of Commerce of Northern California, Muslim Community Association, San Jose Taiko, Sequoia JACL, South Bay Islamic Association, Victoria Taketa, and Wesley United Methodist Church-Missions/Social Concerns Committee. Endorsers: Japanese American Museum of San Jose, Santa Clara County Office of Human Relations, Our Developing World, San Jose Buddhist Church Betsuin, San Jose JACL, San Jose Peace and Justice Center, and Silicon Valley JACL. Please tell the complete internment story…German Americans and Italian Americans were also incarcerated. In, fact many were in the same camps. Please stop telling half-truths!